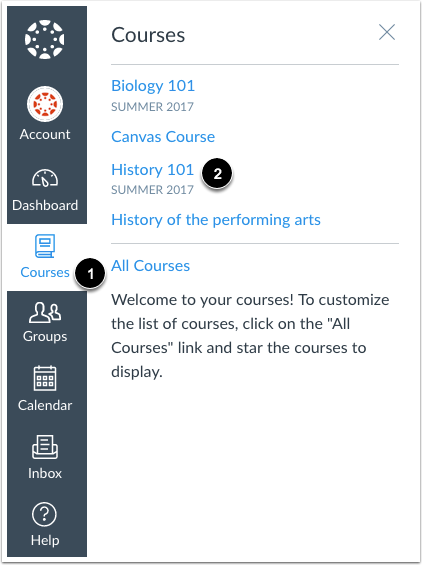 How do I use the Course Activity Stream as a student? The Course Activity Stream shows you important recent activities from a single course including announcements, discussions, assignments, and conversations. This stream is similar to the Global Activity Stream in the Dashboard when you first log in to Canvas. Notifications in the Course Activity Stream will not appear for activity in Files, Collaborations, Grades, Pages, or Conferences; ungraded quizzes and surveys; or edits to Discussions. Edits to Quizzes and Assignments will only appear in the Course Activity Stream when the Notify users that this content has changed button has been selected. If your Course Home Page is already set to view the course stream, the View Course Stream link does not appear in the course sidebar. In the Home Page sidebar, click the View Course Stream button. Note: If your Course Home Page is already set to view the course stream, the View Course Stream link does not appear in the course sidebar. The Course Activity Stream contains recent notifications in the course, including announcements, discussions, assignments, and conversations. 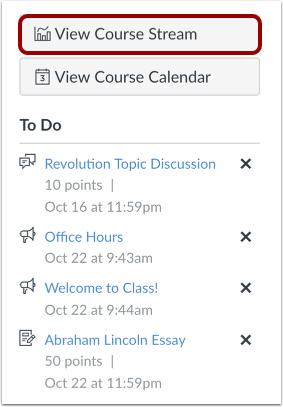 This activity stream helps you see all recent activity in your course and easily ask questions and post to discussion forums. Unlike course cards on the Dashboard, the activity stream does not mimic visibility of Course Navigation links. You can manage recent activity in a course the same way you can on the Dashboard. Activities are indicated by activity type and display an icon  for the activity. New activity in your account is indicated by a blue dot . Discussions and Announcements indicate new activity items published in a course, and Conversations indicate a new message received from a user in a course. Recent Activity items remain for four weeks. Note: To receive notifications for Discussions, you must actively post in the discussions at least once every two weeks. If you stop participating in a discussion after two weeks, Canvas will no longer display discussion notifications. You can view the details of each activity by hovering in the notification area and clicking the Show More link . To collapse recent activity, click the Show Less link . You can directly access your recent activities by clicking the activity link . To remove a notification, click the remove icon . Previous Topic:How do I use the Course Home Page as a student? Next Topic:How do I drop a self-enrolled Canvas course? Table of Contents > Course Navigation > How do I use the Course Activity Stream as a student?